The 1930F Single-Channel Fiber Optic Power Meters deliver affordable high performance for telecom/datacom laser power measurement applications with a direct, standard fiber input. The 1930F series features amplified detector analog output to an oscilloscope or voltmeter for up to 100kHz. Low-noise detectors and seven gain ranges enable continuous power measurements in the range of tens-of femto-W to 2.5 milli-W. The 1930F series power meters include integrated Silicon (SI) or Indium Gallium Arsenide (InGaAs) detectors to support spectral coverage from 400nm to 1650nm. Front panel fiber connections on the 1930F save workspace, while a high-contrast display with an intuitive user interface on the front panel or through USB/GPIB/RS-232 interfaces improve productivity. 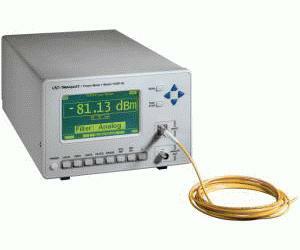 Each instrument is individually calibrated to NIST-traceable standards using Newport’s in-house calibration facility. Calibration data is taken in 10 nm increments, and electronically stored inside the power meter - resulting in accurate power measurements over the entire wavelength band. Certificates of calibration as well as the actual calibration curves recorded are shipped with each instrument. Newport recommends annual re-calibration to assure continued measurement accuracy. In R&D, QA/QC, and manufacturing environments, the 1930F/2930F series power meters enable users to benefit from a high correlation between multiple locations at a price-to-performance ratio second to none.